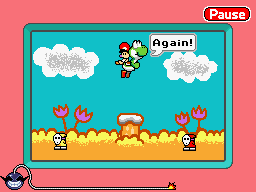 Yoshi is one of 9-Volt's microgames in WarioWare: D.I.Y. The game's setting and music is derived from Super Mario World 2: Yoshi's Island. To win the game, the players have to make Yoshi, who has Baby Mario on his back, ground pound the Post and make the ground shake. This defeats the Shy Guys and turns them into stars. To do so, they have to tap Yoshi two times. The first time he is tapped, he jumps into the air. The second time, the players need to tap the dinosaur while in the air to make him perform a ground-pound. If the players manage to do this before time is up, the game is won. However, if time's up and the Shy Guys aren't defeated, the players lose the game. This page was last edited on July 20, 2018, at 09:26.